“Concept Histories of the Urban” was the final meeting of the CSSD working group Gender and the Global Slum. The two-day workshop on September 16-17, 2016 was organized by by Anupama Rao and Casey Primel, and supported by CSSD, the Center for the Study of Science and Society, Institute for Comparative Literature and Society, and the Heyman Center for the Humanities. 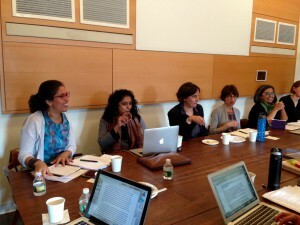 Described by Rao as an experiment in interdisciplinary and inter-regional comparisons and connections, the workshop focused on relating work on urbanizing processes outside of the West with the historical experience of the United States, and the relationship between race, space and social segregation in particular. As participant Andrew Herscher suggested, “The urban is producing concept histories,” thus prompting a rethinking of what constitutes the urban and what is distinctive about the urban. In the first session “Violence and Visibility”, participants discussed papers by Ana Paulina Lee, Assistant Professor in the Department of Latin American and Iberian Cultures, Columbia University, and Mabel Wilson, Associate Professor at the Graduate School of Architecture, Planning and Preservation, Columbia University. Lee’s paper on the spatial (re)configurations of race during Mardi Gras parades in New Orleans and Wilson’s contribution about the political potential of tent cities allowed for discussions of how political claims can be made in various urban contexts. Participants then discussed papers by Nasser Abourahme, Doctoral Candidate in the Middle Eastern, South Asian, and African Studies Department, Columbia University, and by Anooradha Siddiqi, Assistant Professor and Faculty Fellow at the Gallatin School, New York University. Both papers dealt with camps; Abourahme explored the genealogy and political technology of the camp, and Siddiqi questioned why a complex in the periphery of Kenya has remained invisible despite substantial physical presence. The camp, with all its connotations of precarity, also raises issues of permanence, settlement, and home. Anupama Rao and Nicholas Dagen Bloom, Associate Professor of Social Science and Chair of Interdisciplinary Studies and Urban Administration at New York Institute of Technology, elaborated the theme of home. Bloom’s contribution outlined the power and weaknesses of the term “affordable housing” in the context of New York City, and Rao explored the connections between Chicago and Bombay through the concepts of home and and “unhousing” in both cities. Participants continued discussing the theme of unhousing with papers by Debjani Bhattacharyya, Assistant Professor of History at Drexel University, and by Andrew Herscher, Associate Professor of Architecture, History of Art, and Slavic Languages and Literatures at the University of Michigan. Their contributions on the regulation of speculation in colonial Calcutta and on blight in Detroit, respectively, prompted discussion about discourses of housing rights and the relationships between speculation, blight, and enterprise. The next session focused on “Valuation and Financialization.” Adrienne Brown, Assistant Professor of English Language and Literature at the University of Chicago, wrote about appraisal as a process of subjectivity becoming scientific and intersecting with race in the context of the property market. Casey Primel, Volkswagen Postdoctoral Fellow at the Weatherhead Initiative on Global History, Harvard University, and Aarti Sethi, Doctoral Candidate in the Department of Anthropology, Columbia University, both explored the relationship between the rural and the urban. Primel elucidated how land became an object of financial calculation in Egypt and Sethi explored the concept of primitive accumulation in the context of new kinds of agriculture in India. The second day of the workshop began with a discussion of a paper by Anthony Acciavatti, Fellow in the Agrarian Studies Program at Yale University, and a published article by Jonathan Bach, Associate Professor and Chair, Global Studies Program, at The New School. Acciavatti discussed the tubewell as a substitute for the state in the Ganges Basin in India and Bach’s article showed the significance of infrastructure as a political tool in China. These papers led to broader discussions about the relationship between infrastructure and the urban, and the politics and social life that surround infrastructure. Carlos Forment, Associate Professor of Sociology at The New School, raised the issue of citizenship more explicitly with his paper about the notion of “plebeian citizenship” among scavengers in Buenos Aires. The theme of labor continued with a presentation by Rachel Sturman, Associate Professor of History and Asian Studies at Bowdoin College, about the concept of “skill” as relating to skilled and unskilled labor in Mumbai. Laura Diamond Dixit, Doctoral Candidate in Architectural History and Theory at Columbia University, elucidated the importance of climate to the laborer as she vividly described the violence of heat on construction labor in the Persian Gulf. During the final session, Laura Kurgan, Associate Professor of Architecture at the Graduate School of Architecture, Planning and Preservation and Director of the Center for Spatial Research, Columbia University, and Dare Brawley, Program Administrator at the Center for Spatial Research, Columbia University, presented their mapping of destruction in Aleppo as part of the “Conflict Urbanism: Aleppo” project at the Center for Spatial Research. This presentation sparked a lively discussion about the potential uses of these maps, the politics behind mapping, and how to make the methodological issues of mapping more transparent to users. The workshop showcased how connecting projects across time and space can help illuminate shared concepts and forms of urbanism. The recent “spatial turn” in scholarship has demonstrated the importance and value of space to thinking about key issues in the humanities and social sciences, and this workshop highlighted how much remains to be elaborated about what makes something urban and the impacts of the urban on political and social life.